Most of us work for a living, some of us in way swankier places than others. I am curious for a pictorial tour of your office or cubicle. I don’t have a cubicle but I’m not sure that mine qualifies as an office either. It’s more of a room. Or a closet. A sad closet with no windows. Welcome to the RMA lab. It looks like a huge mess of crap. Mostly because it’s a huge mess of crap. I swear there’s a very specific order to it, but if you don’t know the system we have going on here then there’s no point in trying to convince you it’s not a mess. 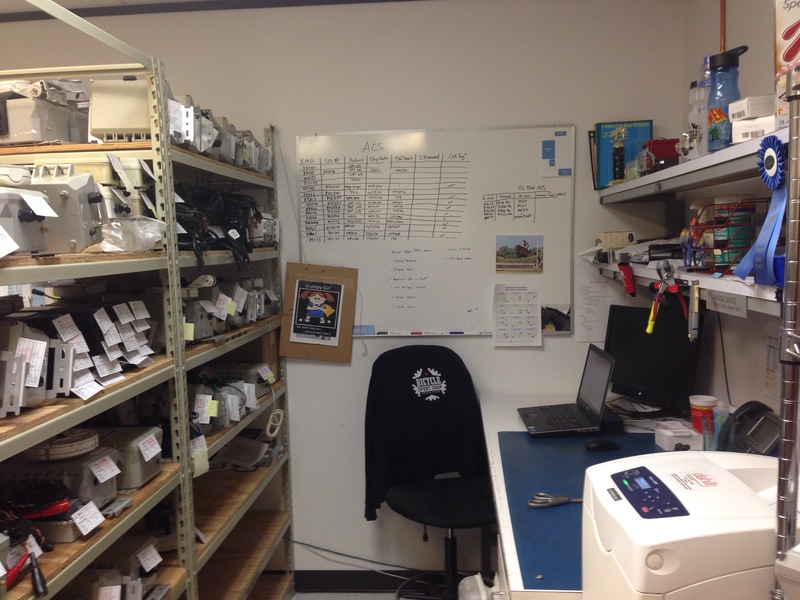 On the left (or behind me, when I’m at my computer) are all the returns and repairs waiting for quotes to be sent out, or waiting for the quotes to be approved by the customer so we can repair their equipment. Then my white board, full of more things that would take forever to explain, and then my space at/above my desk which is mostly markers and cereal and water bottles. There’s a couple horse pictures in there. 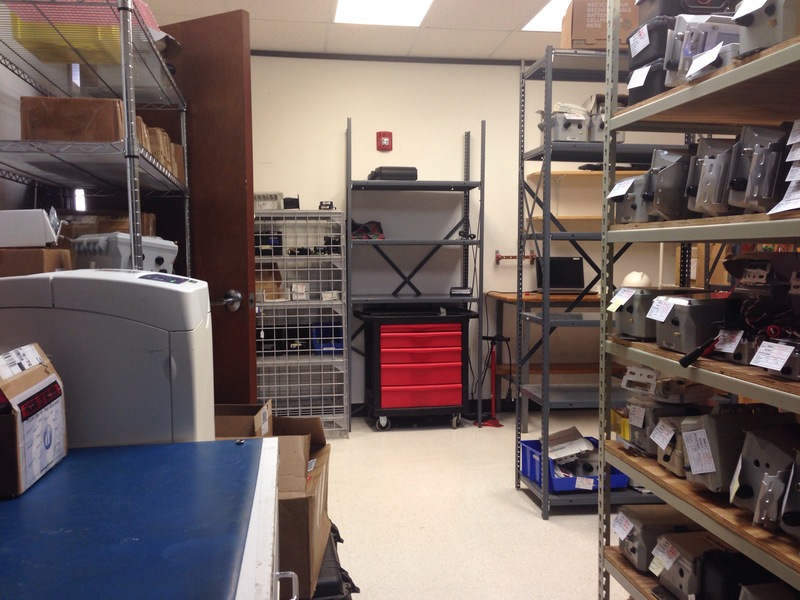 The view from my chair toward the door reveals more and more shelves and boxes and equipment. I won’t even bother trying to explain. Yes it’s claustrophobic. 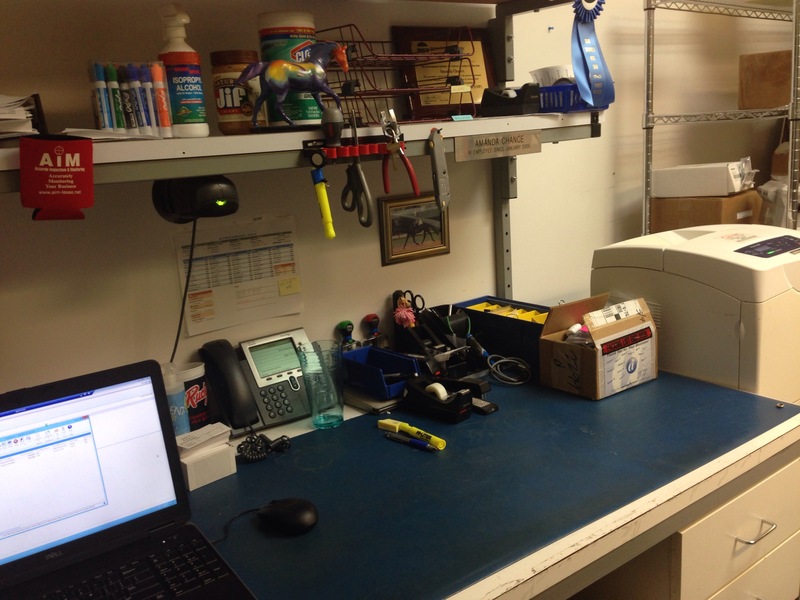 On the other side of my shelves is where the repair and evaluation technician sits. All the important things like a big box of markers, peanut butter, a Painted Pony, a ribbon from some horse show at some point, a koozie, my computer, my phone, etc are on my desk. Oh hey, bonus Jezebel picture on the wall under my tools. Also my nameplate reveals that I’ve worked here forever (or since 2005. same thing.). There’s not a lot of personal stuff in my space, just because a) I’m not into decorating b) this is a coffin, not an office. I do have this lovely sign that a coworker made for me though. It’s good to have a reputation. 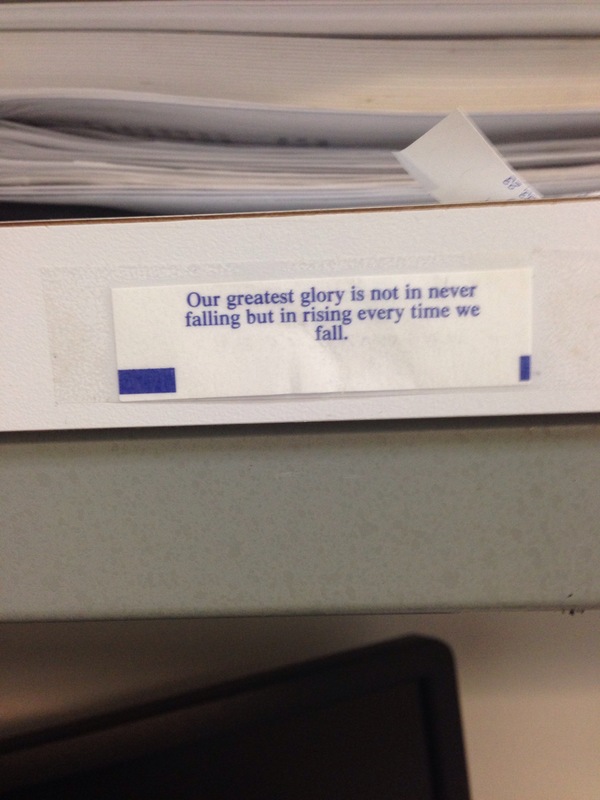 And this fortune I taped to my shelf, because it seemed appropriate. This is how I decorate, folks. Sadly, that’s it. I think I win “saddest office space” so far. Give a sister a skylight or something, at least! 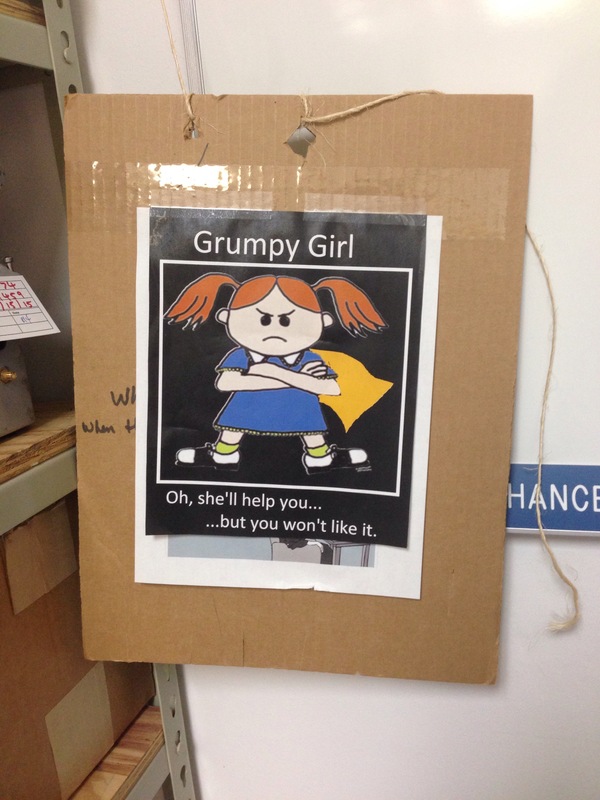 i love the grumpy girl poster haha. and i also scotch tape relevant fortunes to computer screens…. i guess maybe that’s a thing? but yea, needs more light in there! I love your sign! I think I need one of those. lol. Have you been in that same office/room since 2005? They should put in a skylight for your 10-year workaversary. No, I’ve been all over. But I’ve been in this room for like 2 years. Feels a little bit like a prison lol. I would post a picture of my office but I’m pretty sure my firm would be really embarrassed and make me take it down. Let’s just say that my office used to be the storage closet. So I feel you. Why do they put us in the closet??? Still jealous of anyone that has an office/closet. Yep…my kingdom for a DOOR! oh man yes a window is needed… When I worked we had these really funky windows and I always wished we could open them and get some fresh air! That is the saddest work station ever. They need to paint a mural or something so you can at least pretend to be looking outside. That sign is hilarious and so true! !